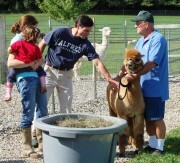 Posted in Farm News | Comments Off on Holiday Open House is Just Around the Corner! Shearing is done! Ready for warmer weather! Posted in Farm News | Comments Off on Shearing is done! Ready for warmer weather!